With the popularity of shows like American Idol, karaoke is no longer found only in smoky Japanese bars. Before you hit the local scene, or if you're too shy to go public and just love singing your favorite songs, what better way to practice than with your own karaoke machine? 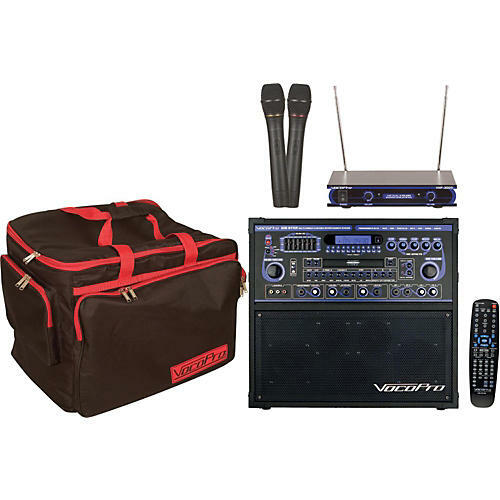 The GIG STAR Karaoke Machine Package includes not only Vocopro's 4-speaker, 100W karaoke machine, but a VHF-3000 wireless mic, and a coupon/mail-in rebate for a free bag to make all your karaoke equipment extremely portable. The Direct Track Access of the VocoPro GIG STAR Karaoke machine supports DVD, VCD, CD+G, MP3, Photo-CD, CD, CD-R, and CD-RW formats, and even lets you sing along to what's on the radio with its AM/FM tuner. There are Digital Echo, Repeat, and Delay controls to help you with vocal enhancement as well as Vocal Cancel and Partner modes for singing duets or canceling vocals from multiplexed media. A 7-band EQ will help you adjust the sound to work better with the room's acoustics. You can even hook it up to external speakers for more professional uses in a club or restaurant. It can also be used for practicing along with a guitar and keyboard as it has 1/4" inputs with individual volume controls for each.